Greg, John, and Pat discuss the prediction made by author Neil Postman in 1992 when he said in the future that men would look to technology as God. They continue to discuss how technology has changed so much over time from the Gutenberg Press to the technology we have today. They continue to discuss how when people think about technology what often comes to mind is what they will get but what is often not thought about is what they will lose. Neil Postman, the author of Technopoly: The Surrender of Culture to Technology in the book he makes several observations as well as predictions. One such prediction is how people would turn to technology instead of turning to God. Neil said that America was turning to a new religion; technology. They continued to discuss the importance of not submitting to technology but having technology submit to God. They continue to discuss that with every new advancement in technology you just don’t have what you had plus the technology but instead what you had or were morphs into something new with the infusion of technology. They continue to ask the question whether you turn to God or to your technology when you wake up in the morning. They continue to ask if your hope is in God or technology. What was discovered is when people seek God maybe He answers maybe He doesn’t. However they found out that when you seek answers from technology, the internet, an immediate answer is provided. Searching the internet doesn’t make one smarter it just gives you access to what someone else knows. They challenge us to imagine if technology wasn’t around. Would we continue to worship God? Would we be able to seek God with a Bible, journal and pencil? Technology changes things and if you’re not careful you will begin to entertain yourself until you are in a deep sleep and even death. There are different uses for technology they encourage us to use it for God’s glory. 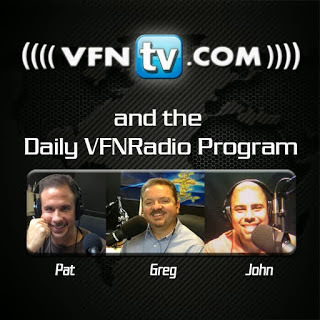 Greg, John, and Pat discuss a prayer for America and the Church prayed by an 11 year old boy. They continued to discuss how he was also given four dreams around the same time the Lord was speaking to Greg regarding a prophetic word about how it’s going to be a physical battle and not just spiritual. In the dreams he received from the boy God showed him what was going to happen to America, the church, and how the President could be helped. They continued to discuss the lyrics in a song that said the greatest travesty was to honor God with our lips and to deny him with our lifestyles. This is going to be a great test for America and the church; it’s important to be prepared.